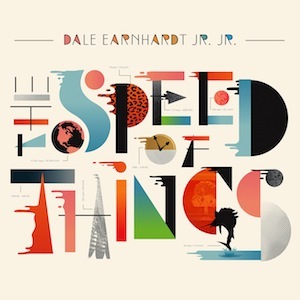 “The Speed Of Things” by Dale Earnhardt Jr. Jr.
Modern electronic pop success stories either make the sort of music that sells orange juice or get plopped into VH1’s morning snooze button video programming. Detroit’s Dale Earnhardt Jr. Jr. are next in line for these trappings, but their gorgeous compositions deserve to stand on their own. The Speed Of Things mutes the homegrown folk of It’s A Corporate World, but the hallucinatory touches are a worthy replacement. The initial energy is so overwhelming that we worry The Speed Of Things is going to wear itself out. Thankfully the album takes breathers in all the right places. An uncomplicated reprise of “Beautiful Dream” leads perfectly into “Mesopotamia,” an avalanche of clicks and scratches whipping up a frenzy. “Dark Water” cautions, “if you rise too fast, your lungs will just collapse.” Whether rigorous or reassuring, DEJJ know how to pace themselves and their audience. We are stunned at how something so lightweight can also be so robust. We applaud Dale Earnhardt Jr. Jr.’s move from the fringes to the forefront, overcoming their ridiculous moniker with consistently superior songs.